Casa Mila also known as La Pedrera, by Antoni Gaudi, as seen from above is a magnificent sample of fully functional organic Art Nouveau design. Notice the undulated eaves, the arched attic walls that used to hold the washrooms, the small windows not always at the same level to allow ambient light and provide ventilation for the laundry and the peculiar inner court and air shaft of the building. 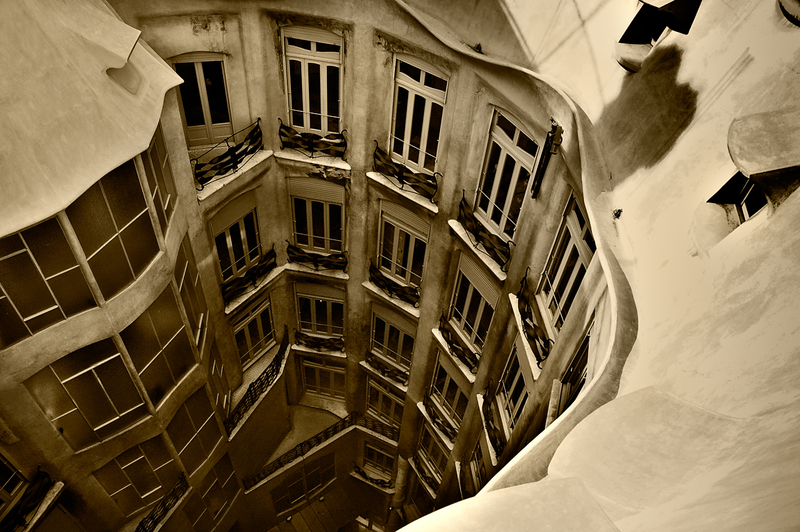 Perhaps you would get the mood better if you admired La Pedrera in this video on YouTube about modernista architecture in Barcelona. Gran foto, felicidades! .......y yo que todavia no la he visitado! This is a captivating photo. You captured the undulations so well. Great photo. Casa Milà is one of the most impressive buildings in Barcelona. I love Gaudí!